of Telangana TSPSC Recruitment 2017. These TSPSC Veterinary Assistant vacancies recruitment will be done through the written exam personal interview only. 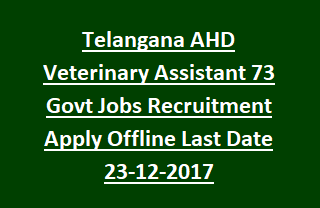 Interested and eligible candidates belong to Telangana State can submit their application form online on or before 23-11-2017 for this TSPSC Veterinary Asst Jobs. Application form available from download from 15-11-2017 @ TSPSC official website of www.tspsc.gov.in. For more details regarding this TSPSC AHD Veterinary Assistant Jobs Recruitment Exam 2017 age limits, exam syllabus and pattern, pay scale and more details given below. There are total 74 vacancies available in TSPSC current recruitment of Veterinary Assistant. Candidates must have completed Animal Husbandry Polytechnic Course from Sri Venkateswara Veterinary University, Tiruapti. Or Inter Vocational course in Diary and Poultry Sciences or 2 years poultry diploma course Polytechnic, Ramachandrapuram of Sri Venkateswara Veterinary University, Tiruptai. As on 01-07-2016 for the general candidates age limits are 18 to 44 years. For SC/ST and OBC candidates age relaxation is 5 years. Selection will be held through online based written exam and interview. Written exam will be objective type only. Based on merit in educational qualifications merit list will be prepared. Written exam will be conducted for 300 marks and consists two separate papers. Download application from www.tgahd.nic.in. Last date for submission of application form for this Veterinary Assistant Jobs recruitment is 23-12-2017. Download official notification of TSPSC Animal Husbandry Department Veterinary Assistant Recruitment 2017. AP AHD Veterinary Assistant Surgeon Recruitment 2016: Government of Andhra Pradesh released notification to recruit the available Backlog vacancies of Veterinary Assistant Surgeon posts in Animal Husbandry Department of Andhra Pradesh State. There are total 50 vacancies available in Animal Husbandry Department of Andhra Pradesh. This AP Veterinary Assistant Surgeon vacancies recruitment will be done through personal interview or written exam. Interested and eligible candidates belong to Andhra Pradesh State can apply in a prescribed format to the Director of Animal Husbandry Department, VIjaywada from 12-11-2016 to 28-11-2016. For more details regarding this AP Veterinary Assistant Surgeon recruitment 2016 age limits, qualifications and more details given below. There are total 50 vacancies available in TSPSC current recruitment of Veterinary Assistant Surgeon Exam 2016. SC-11, ST-41, BC-E-4 and for OC-PH-01 Post. Candidates must have completed a Bachelor’s Degree in Veterinary Sciences and Animal Husbandry or its equivalent from recognized University or Institution in India or abroad. As on 01-07-2016 for the general candidates age limits are 18 to 42 years (As per GO No 396 General Administration Department). For SC/ST/BC candidates upper age limit is 5 years. Selection will be based on merit in educational qualifications and personal interview. If required written test will be conducted. Candidates can download the application form from the official website AP Animal Husbandry Department @www.apahd.gov.in. Complete all required documents and provide valid communication details of mobile number and mail id. Application form to be the office of the Director of Animal Husbandry Department, NTR SSVH Campus, Labbipeta, Andhra Pradesh, Vijayawada – 520010 on or before 28/11/2016 by 5.00 P.M. On Cover letter mention as "Application for the post of Veterinary Assistant Surgeon". Download official notification of AP Animal Husbandry Department Veterinary Assistant Surgeon Recruitment 2016. Download Application form here for Veterinary Doctors Recruitment in Andhra Pradesh.